Description: This small tree usually has a single trunk that is often crooked and a broad rounded crown; it is up to 35' tall. The trunk is up to 1¼' across; it is somewhat fluted and appears muscular, hence the common name. On young trees, the trunk bark is slate gray and very smooth, while on old trees the trunk bark is gray or brownish gray, irregularly and finely fissured, and slightly rough. The branches and twigs are relatively narrow and crooked; the bark of twigs is reddish brown to brown and smooth, while the bark of larger branches is gray and smooth. Alternate deciduous leaves occur in 2 ranks along twigs and young green shoots; the shoots are glabrous or pubescent. The leaf blades are 2½-5" long and 1-2" across; more narrow blades are elliptic to elliptic-oblanceolate in shape, while more wide blades are broadly elliptic to elliptic-oblanceolate. The margins of the leaf blades are doubly serrated. Veins of the leaf blades are arranged pinnately with 10-13 lateral veins on each side of the central vein; these lateral veins are nearly straight. The upper surface of the leaf blades is medium to dark green and hairless to sparsely short-hairy, while the lower surface is pale to medium green and sparsely short-hairy. Musclewood is monoecious, producing separate male (staminate) and female (pistillate) flowers on the same tree. The male flowers are arranged in drooping sessile catkins about 1-2" long that are located toward the tips of twigs. Individual male flowers have several stamens that are partially hidden by single reddish green bractlets that are ovate-deltate in shape. The female flowers are arranged in pairs on short hairy racemes about ½-¾" long; these racemes develop at the tips of twigs. Individual female flowers consist of an ovary with a pair of red stigmata; they are partially hidden by single green bractlets that are narrow in shape and somewhat spreading or recurved. The blooming period occurs during mid- to late spring as the leaves begin to develop; the flowers are cross-pollinated by wind. Afterwards, the paired female flowers are replaced by paired nutlets and bracts that develop in dangling racemes about 2-5" long. Each nutlet lies at the base of a 3-lobed bract that is about 1¼" long, 1" across, and hastate in shape; these bracts become light brown at maturity. Each mature nutlet is about ¼" long, broadly ovoid in shape, and tapering to a short beak; its thin husk is brown and slightly hairy. Because of their relatively large bracts, these nutlets are distributed by the wind to a limited extent. The woody root system is shallow and spreading. During the autumn, the deciduous leaves turn yellow, orange, or red before falling to the ground. Cultivation: The preference is partial sun to moderate shade, moist well-drained conditions, and fertile loamy soil with decaying organic matter. Musclewood grows slowly; it produces nutlets in as little as 15 years and may live up to 100 years. Range & Habitat: The native Musclewood is occasional to locally common in most areas of Illinois, except in the NW section of the state, where it is uncommon or absent. Habitats include rich moist woodlands, east- and north-facing slopes of wooded bluffs, bases of wooded bluffs, shady ravines, wooded areas of river valleys, streambanks in wooded areas, higher ground in swamps, and shaded gravelly seeps. This tree also occurs in upland woodlands, where it is less common. Musclewood is a typical understory tree of Maple-Beech and Maple-Basswood woodlands. Faunal Associations: Miscellaneous insects feed on the foliage, wood, and sap of Musclewood. These species include the caterpillars of Baileya ophthalmica (Eyed Baileya) and other moths, Agrilus ohioensis and other wood-boring beetles, Lygocoris carpini and other plant bugs, the aphid Macrosiphum carpinicolens, and several leafhoppers; Musclewood is a preferred host of the leafhoppers Eratoneura direpta, Eratoneura triangulata, and Erythridula modica. The Insect Table provides a more complete listing of these insect feeders. The nutlets, buds, or catkins of Musclewood are eaten by the Wood Duck, Ruffed Grouse, Bobwhite, Yellow-Rumped Warbler, and probably other birds. Among mammals, beavers use the wood as a source of food and construction materials, the Gray Squirrel and Fox Squirrel eat the nutlets, and rabbits browse on young seedlings of this tree. White-Tailed Deer occasionally browse on the leaves and twigs of Musclewood, but it is not preferred as a food plant. As a result of selective browsing, this small tree has proliferated in some areas of eastern United States (Kershaw, 2007; Sullivan, 1994). Some birds use Musclewood occasionally for nesting habitat; the Wood Thrush has been observed to build nests in its branches, while the Black-Capped Chickadee and Carolina Chickadee use small cavities in older trees as locations for their nests (Eastman, 1992). Photographic Location: Lower wooded slope near a lake in Coles County in Illinois. 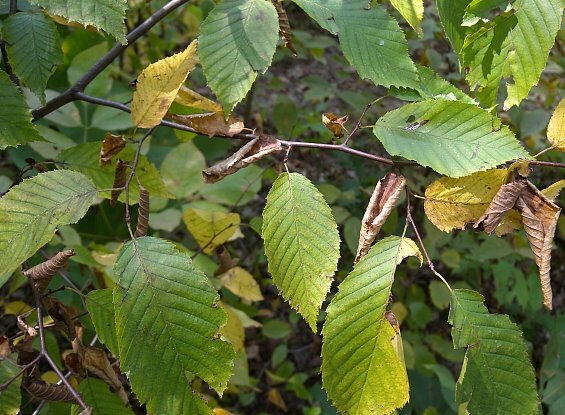 Comments: Other common names of this small tree are Blue Beech, American Hornbeam, and Ironwood. This last common name is somewhat ambiguous because it sometimes refers to Ostrya virginiana (Hop Hornbeam). 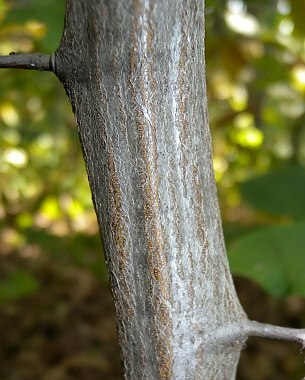 In Illinois, the overwhelming majority of Musclewood trees are examples of ssp. virginiana, which has a more northwestern range than the typical subspecies. However, the latter can be found at the southern tip of Illinois, where it is rare. Where their ranges overlap, these subspecies sometimes intergrade. The more northwestern ssp. virginiana differs from the typical subspecies by having leaf blades that often exceed 3½" long and they tend to have a more narrow shape. Unlike the typical subspecies, it may have tiny dark glands on the lower surface of the leaf blades. Regardless of subspecies, Musclewood is relatively easy to distinguish from other trees on the basis of its smooth fluted bark. While this tree could be confused with small specimens of Fagus grandifolia (American Beech), which also has smooth bark, its leaf blades have more teeth along their margins than those of American Beech. Musclewood is an attractive small tree overall, with interesting bark and colorful leaves during the autumn. Some authorities assign Musclewood to the Birch family (Betulaceae).